“Oh the Places You’ll Go” is not only perfect for March is Reading Month, Read Across America, or a "Celebration of Seuss" Week. but the story is also appropriate at the end of the year, when students are advancing into a new grade or graduating! With that in mind, I decided to combine reading and writing with a bit of geography, with these super-fun “Oh, the Places I’LL Go!” crafts. Students think of a place they’d like to travel to. Money is no object, so the world is literally at their feet. There are two writing prompt craftivities in this packet. The writing provides an interesting way to practice & reinforce the “5 Ws + 1 H” question words in a fun way: “Where would you like to travel to?”, "When would you like to go? ", "Why do you want to go there? ", "Who do you want to go with? ", "What do you want to see?" and "
do you want to get there?" Be sure and check the PREVIEW to see lots of completed samples. I’ve also included a poster with the questions, which you can use to introduce your lesson. 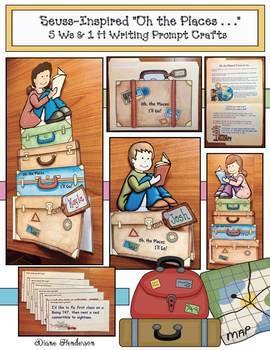 Another option, is to glue their trunk booklet to the base of a stack of suitcases, which can also be topped with one of the ”students reading a book” graphics. You decide what’s best for your kiddos, or give children a choice. A luggage tag for a student’s name, adds some 3D pizzazz. I’ve included a variety of posters, as well as letters for the caption: “Oh, the Places We’ll Go!” to add extra pizzazz. While designing the first “Oh the places” HAT craft, I decided to divide things up and make a separate packet with a young child reading, as well as another packet featuring older students, instead of putting everything into one purchase. By making 3 separate packets, teachers can choose which craft is most appropriate for their students and grade level. This also keeps the price down. While the writing prompt CRAFT is different in all 3 of the packets, they do include the SAME posters & letters for the bulletin board caption. "Oh the Places I’ll Go for LITTLE Readers"
I’m Diane from Teach With Me, wishing you an exciting journey, as you travel & teach.